The work of Filii Passionis in this new endeavor of publishing hopes to provide pocket-size editions of liturgical catechesis and books on Passionist spirituality. 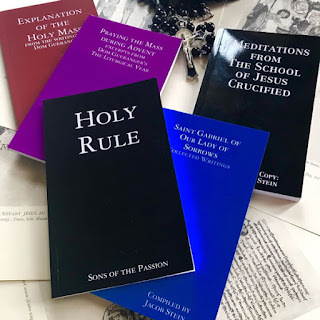 Your purchase supports the formation of a house of traditional reform of the Passionist Rule of Saint Paul of the Cross. We are currently a small group of men discerning the proper steps to move forward in this endeavor. On February 16th of each year, the Dominican Order recalls the life of Blessed Nicolas Paglia. Even though he is not well known outside of the Order, his holiness of life should be shared to inspire all of us. Blessed Nicola Paglia was born in 1197 in Giovinazzo near Bari, Italy to Italian nobility. As a child, he received a vision of an angel who warned him not to eat meat as he would one day join a religious order that had a permanent rule of abstinence. That day came in 1217. 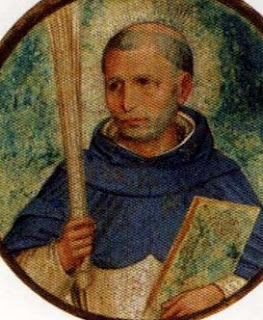 As Blessed Nicola was traveling to Bologna to complete his education, he heard St. Dominic speak for the first time. The man was so moved from St. Dominic's sermon that as soon as the saint exited the pulpit Blessed Nicola rushed over and asked him for immediate admission into the Order of Preachers where he would later be ordained to the priesthood. Like St. Dominic, Blessed Nicola was regarded as a successful preacher. Blessed Paglia served two terms as provincial of the order's Roman province and he founded convents in Perugia and Trani where he settled in. He preached at length and with success for the conversion of the Jewish people to the Christian religion. He also promoted Scripture study and compiled a Bible concordance. Pope Gregory IX also commissioned him to preach a crusade against the Saracens. He was regarded as a miracle worker. Finally in 1256, he departed this world for the next. He is interred in the Church of San Domenico in Perugia and was beatified by Pope Leo XII in 1828. Blessed Nicola Paglia, pray for us! Their product is a re-imagined Rosary born out of the hands of Soldiers - That is what their small team of dedicated and devoted artisans hand make every day in their rosary studios in Northern California. They recognize how personal a rosary is and realize that some people are happier with a rosary which is stronger, and more tactical than the usual jewelry style rosary beads. They have been creating their original Paracord Rosaries since 2012. 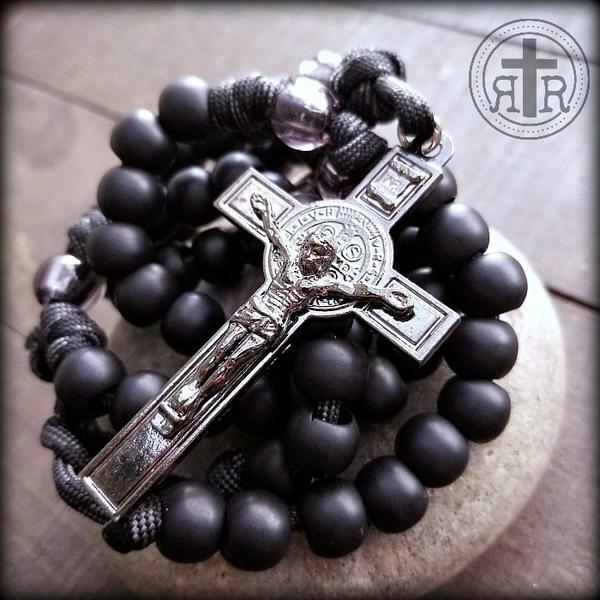 Their rosaries have the ruggedness to carry you through your day - every day - no matter where life takes you. They are made to withstand the battle. Your prayer and devotions will be more fulfilling when you don't worry about your rosary breaking, tangling up, snagging on clothing, or falling apart. These are not your grandmother's delicate rosary beads! 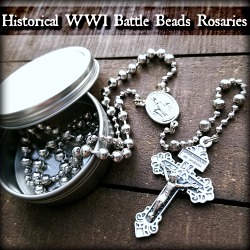 The organization also hand make historical WWI Battle Beads Rosaries. These are replicas of 1916 government service combat rosaries issued first during WWI and subsequently in WWII. They were also available in stores in later decades, as late as the 1960's, which is where the inspiration for the design of the WWI Battle Beads was acquired. They are the only company offering it with stainless steel beads, double loop split ring construction, and customizable formats. St. Francis said, "It is in giving that we receive." In gratitude for the many blessings they receive, they even donate a portion of their sales to St. Paul's Street Evangelization, and other various Catholic ministries, charity auctions, and events. Why is 12 PM Called Noon? Have you ever wondered why we English speakers call the hour of 12:00 PM by the word "noon"? The answer is actually rooted in the history of the Catholic Church. Some background: In the ancient world the "first hour" of the day was what we know as 6:00 AM. The 3rd hour was 9 AM, the 6th hour was 12 PM, etc. This makes sense when you realize the Scripture refer to Jesus as hanging on the Cross from the sixth to ninth hour (cf. Matthew 27:45, "Now from the sixth hour there was darkness over the whole earth, until the ninth hour"). This is corroborated by the fact that we know the Lord hung on the Cross from 12 PM to 3 PM in our modern sense of time. So now that we understand that background in time, it's also important to understand that the Church since Her early days instituted prayers to be said throughout the day. Known presently as the "Divine Office" - or in the modern day as the "Liturgy of the Hours" - all monks and consecrated religious like nuns and priests pray these prayers. They occur traditionally 7 days a day at various hours. And their Latin name relates to the time of day. 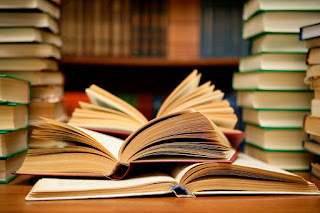 For instance, Terce is traditionally said at 9 AM and "Terce" is derived from the word for three, since it is the "third hour" in the day using the ancient sense of time. Noon's prayer is known as Sext. And the one at 3 PM is called None. So why is 12:00 called by the prayer that is traditionally said at 3 PM? It is entirely due to Lent. Thus, 12:00 became known as Noon! Share this interesting piece of trivia with your friends! Cardinal Robert Sarah who heads the Vatican’s Congregation for Divine Worship has decried Communion in the hand and is summoning the Catholic faithful to return to receiving Communion on the tongue while kneeling. 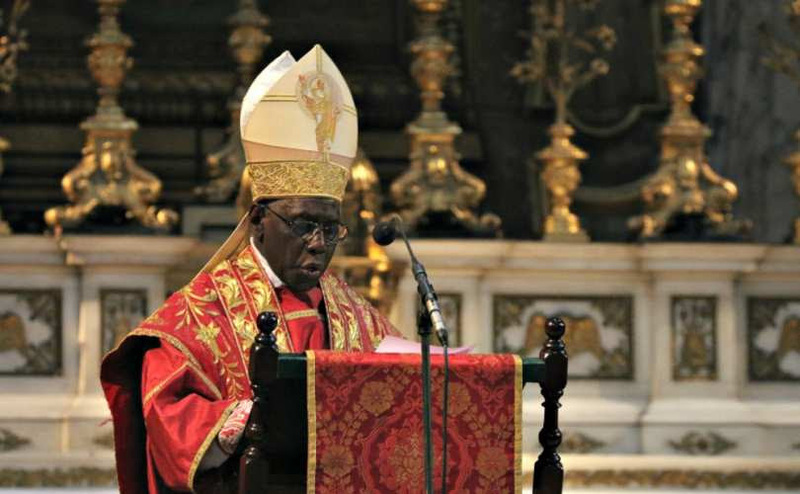 In the preface to a new book on the subject, Cardinal Sarah warns that lack of reverence for the Blessed Sacrament is the major disorder undermining the Faith today and that Communion in the hand was deliberately sown by the devil for this very end. “The most insidious diabolical attack consists in trying to extinguish faith in the Eucharist, sowing errors and favoring an unsuitable manner of receiving it," the cardinal wrote. "Truly the war between Michael and his Angels on one side, and Lucifer on the other, continues in the heart of the faithful: Satan’s target is the Sacrifice of the Mass and the Real Presence of Jesus in the consecrated Host." Sarah hits the nail on the head, since the major crisis facing the Church today is the loss of the awareness of the supernatural presence of Christ in his tabernacle. With the crisis ever intensifying, it somehow has evaded the hierarchy that the crux of the problem has been our denigrating regard for the Holy Eucharist, encouraged most especially by this errant practice of receiving Communion in the hand. This is a Protestant practice that was introduced in the sixties by renegade bishops to detract from Christ’s divinity and foment disbelief in the Real Presence. However, the faithful are not empowered to touch the Body of Christ as in the priesthood, which is why Communion in the hand was never *promulgated as a universal practice for the Church. And whereas it is allowed today as common law, lay people are not consecrated to handle the Blessed Sacrament, so that should they do so, a sacrilege is committed. This in turn brings on spiritual repercussions and draws the plague of the devil upon the church, so that what is nurtured is an adulterated mindset (evidenced by all the profanation and display of indecency in church), as well as heretical notions about the Sacrament and the Holy Sacrifice (i.e. 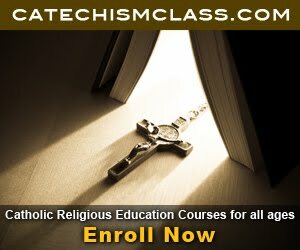 the Eucharist is holy bread, the Mass is a meal, the Mass is a community gathering, etc.) If Catholics today no longer believe that the Eucharist is the Creator Himself in person, it is because of this diabolical practice that has cheapened their religion and nurtured this apostate mentality. It was for reason that Pope Paul VI in his instruction Memoriale Domini (May 29, 1969), warned that Communion in the hand “carries certain dangers with it… the danger of a loss of reverence for the August Sacrament of the altar, of profanation, of adulterating the true doctrine." (touching that which we ought not), which calls to mind the transgression of Eve when she rose up in her pride and partook of the forbidden fruit. However, the author of both is the devil, who is given great strength to work in the Church through this practice. His objective is to destroy the monarchical concept of the Church so that Christ is now seen as mere man, “symbolized” by bread and wine, and Communion in the hand has been an effective tool in hand to advance this heresy. Pope Paul VI in his 1969 pastoral letter reaffirmed the Church’s teaching on the reception of Communion, stating, “This method [on the tongue] must be retained.” This was in response to the Dutch bishops who were clamoring for Communion in the hand against his wishes and in defiance of the centuries-old prohibition against it. Communion in the hand has in fact received several ecclesiastical condemnations. The Council of Saragossa (380 AD) excommunicated anyone who dared continue receiving Communion in the hand. This was confirmed by the Synod of Toledo (589), known for its staunch defense of Christ’s divinity. The Sixth Ecumenical Council of Constantinople (680-81) likewise forbade the faithful from taking the Host in their hand, even threatening transgressors with excommunication. A grave fault it is that bishops through poor liturgical discipline have allowed the faithful to fall into the lamentable blindness of not acknowledging the physical and supernatural presence of Christ in the Eucharist. Because of Communion in the hand and other like shams, many today do not understand what the Mass is. During the Consecration of Holy Mass, the Sacrifice of Christ is reenacted through the commemorative formula commanded by Christ to his Apostles—This is My Body, This is My Blood—so that upon consecration, the substance of bread and wine is changed into the very substance of Jesus Christ. It is no longer the substance of bread and wine, but the substance of Christ, only and entirely, without any other substance mingling with it. Only the accidents or physical properties of bread and wine remain. The acknowledgment of this supernatural Mystery is the first and foremost requirement placed on the faithful to receive Holy Communion, without which one may not receive. To this end, the Church has always taught that communicants not touch the Host, since it is the very substance of the Creator which only the consecrated hands of a priest may touch. Hence by allowing lay persons to handle the Host, it tends to erase this dogmatic fact from mind and suggests that Holy Communion is just a formality, i.e. a holy meal, a community gathering, in which people can come up in cafeteria fashion to have their “blessed bread.” It promotes all manner of disrespect, e.g. women coming up in promiscuous attire, tattooed, etc. Gallop surveys indicate that a mere 30 percent of America’s Catholics believe in the True Presence. And whereas Pope Francis may see strict adherence to dogma as “idolatry,” he needs to understand that without preserving dogma through traditional discipline, people will fall into the idolatry of human worship where they turn to each other at Mass instead of to God. The faithful would do well to consider the conduct of Moses when he approached the burning bush in the mount. The Lord ordered him to put off his sandals because he was on holy ground. And "Moses hid his face: for he durst not look at God." (Exodus 3:6) And to think that this was only a manifestation of God's presence, not an actual physical presence. With how much greater reverence must we approach the altar where the Creator Himself dwells day and night in full Body and Spirit? Shall we mock Him and do a little dance (guitar Mass), and then stick our dirty hands out and try to make the Lord of Hosts our pet wafer? God forbid! Thanks to Communion in the hand, members of satanic cults are given easy access to enter the Church and take the Host, so that they bring it back to their covens where it is abused and brutalized in the ritualistic Black Mass to Satan. They defecate on the Host and crush it under their shoes as a mockery to the living God, and we do nothing to stop this? Among themselves satanists declare that Communion in the hand is the greatest thing that ever happened to them, and we assist them with our casual practice? Mike Warnke, a former satanic high priest who converted to Christianity, warned the U.S. bishops that allowing Communion in the hand was a mistake, pointing out how this allows satanists easy access in procuring the host, which they desecrate in their rituals. It was for reason that Benedict XVI attempted to reverse this practice during his pontificate. The pope was clear that he did not want Catholics receiving Communion in the hand, nor did he want them standing to receive, for which reason the faithful at his Masses were required to kneel and receive on the tongue. The centuries-old ordinance allowing only the consecrated hands of a priest to handle the Body of Christ also rules out lay “Eucharistic Ministers.” The Council of Trent puts to shame today’s burlesque practice of allowing lay people to distribute Communion. This stems from the fact that lay people’s hands are not anointed to touch the Eucharist, unlike the hands of a priest. St. Thomas Aquinas beautifully articulates this teaching in his Summa Theologiae. Communion in the hand, more specifically, is tied to the late Cardinal Suenens of Belgium, a known heretic and initiated Freemason (initiated 6-15-67, code-name “LESU”) who introduced this practice to the Dutch bishops in the mid-sixties. Suenens, who oversaw the implementation of the worldwide charismatic “renewal” in the Catholic Church and who advocated married priests, was notorious for defaming the Eucharist and the priesthood. However, Communion in the hand goes back to the heretical Arians of the third century who introduced this practice as a means of expressing their belief that Christ was not divine. 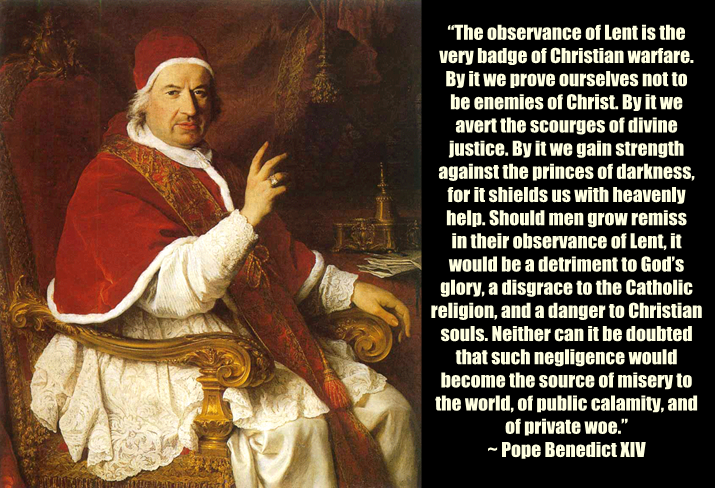 Unfortunately, it has served to express the same in our time and has been at the very heart of the present heresy and desecration that is rampant throughout the universal Church. If we have “abuse” problems today, it is because we're abusing the sacrament—it’s backfiring on us! Pope Benedict XVI did his part to try to purge the Church of this abuse, seeing how it has contributed mightily to the loss of the awareness of the Mystery of Faith. 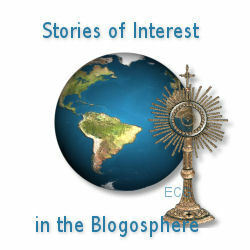 We might say that a form of ‘Eucharistic atheism’ has set in. Poor liturgical discipline has contributed mightily to apostasy, so the remedy is to return to our knees and receive the Eucharist on the tongue. Without this basic humility before the Eucharist, our efforts at restoring the Church are futile. * In 1969, Pope Paul VI made an exception for the bishops of Holland by leaving it up to them to decide whether to adopt this practice, though he very much dissuaded it. Unfortunately, it spread rapidly from Holland to other countries with no formal sanction from Rome. For those Catholics who wish to more closely follow the ancient customs of the Church, Lent is a time of austere penance undertaken to make reparation to God for sin (our own sins and others), to grow in virtue and good works, and to comfort the heart of our Savior much offended by the barrage of sin and filth increasing by the day. Yet, there are very few Catholics who undertake the true discipline of prayer, fasting, and almsgiving. How many of us are observing all 40 days as true fast days and not just Ash Wednesday and Good Friday? Yet our ancestors did. In fact, it was forbidden to eat meat or any animal products (e.g. eggs, dairy, cheese, butter, etc) through all of Lent. How many of us are making this kind of intense sacrifice? How many of us are finding the time this Lent to pray the Rosary every day or go to Daily Mass more often or at least pray the Stations of the Cross each Friday? And yet, how many people indulge in public sin, lust, and gluttony on Fat Tuesday in a mockery of our ancestors? Nowadays, no one - or at least few of us - fast for all forty days. Yet, people are engaging in eating on Shrove Tuesday like they were. It is a mockery of the Faith! How many people are fasting by "light eating" on Ash Wednesday and then indulging on cheeseburgers on the Thursday after Ash Wednesday on a Lenten feria day! Even the great liturgist Dom Guaranger wrote of the excesses and sinfulness of Mardi Gras in his own time. And how much worse it is in our own times than his, who lived from 1805 to 1875! 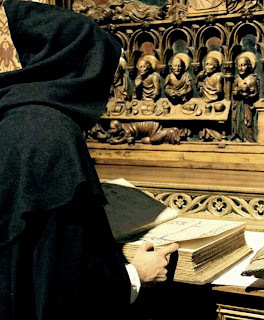 How far from being true children of Abraham are those so-called Christians who spend Quinquagesima and the two following days in intemperance and dissipation, because Lent is soon to be upon us! We can easily understand how the simple manners of our Catholic forefathers could keep a leave-taking of the ordinary way of living, which Lent was to interrupt, and reconcile their innocent carnival with Christian gravity; just as we can understand how their rigorous observance of the laws of the Church for Lent would inspire certain festive customs at Easter. Even in our times, a joyous carnival is not to be altogether reprobated, provided the Christian sentiment of the approaching holy season of Lent be strong enough to check the evil tendency of corrupt nature; otherwise the original intention of an innocent custom would be perverted, and the forethought of penance could in no sense be considered as the prompter of our joyous farewell to ease and comforts. While admitting all this, we would ask, what right or title have they to share in these carnival rejoicings, whose Lent will pass and find them out of the Church? And they, too, who claim dispensations from fasting during Lent and, for one reason or another, evade every penitential exercise during the solemn forty days of penance, and will find themselves at Easter as weighed down by the guilt and debt of their sins as they were on Ash Wednesday ‒ what meaning, we would ask, can there possibly be in their feasting at "Mardi Gras." In our modern world, when sinful indulgence is the rule all year long, it is especially sad to see the annual repetitions of the most decadent carnival celebrations taking place in formerly Catholic cities. But even long ago the need for reparation for such scandalous debauchery was recognized. The Church offered a substitute for frivolous amusements and dangerous pleasures; and those of Her children upon whom faith has not lost its influence, found a feast surpassing all earthly enjoyments, and a means whereby to make amends to God for the insults offered to His Divine Majesty during the days of carnival. The Lamb Who taketh away the sins of the world was exposed upon the altar. Here, on His throne of mercy, He received the homage of them who came to adore Him, and acknowledge Him for their King; He accepted the repentance of those who came to tell Him how grieved they were at having ever followed any other Master but Him; He offered Himself to His Eternal Father for poor sinners, who not only treated His favors with indifference, but seemed to have made a resolution to offend Him during these days more than at any other period of the year. It is a shame. It is a public scandal. And our Lord Himself has asked for reparation. 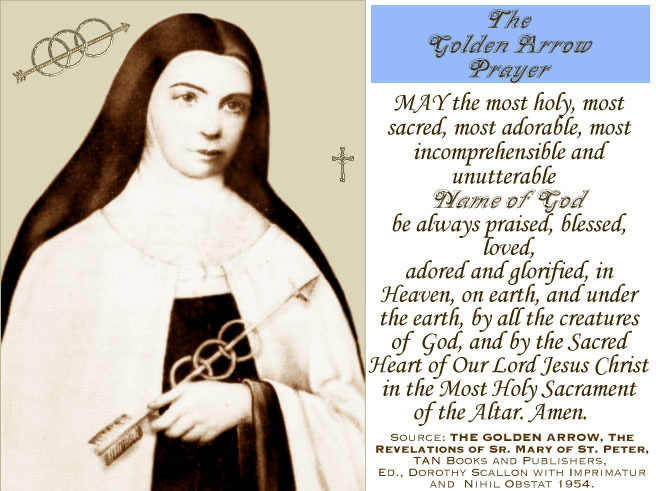 And even though we are now after the Tuesday in Quinquagesima, I am asking everyone reading this article to take a few minutes and comfort the heart of our Savior, who is much offended, by praying the Golden Arrow in honor of His adorable Face. May God be pleased with our Lent. And may we be undertaking penance (abstinence, fasting, prayer, and almsgiving) to make reparation to God for our sins and those of others. All are hardcovers in good condition. All books are $20/each. All prices include shipping. 1. "Mohammed and Charlemagne," Henri Pirenne, 1992 re-print of 1930s work, 274 pp. 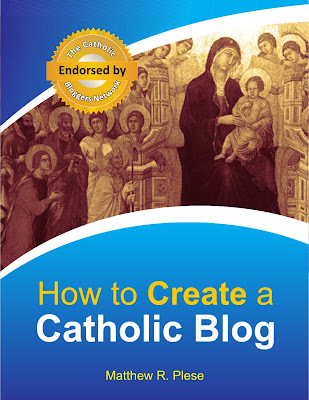 In order to better share the articles of others, re-share old yet timely articles from this blog, and to better engage with the world, I have expanded A Catholic Life's presence on social media. Please like, follow, and share us! A Catholic Life Facebook - We now have our own Facebook Page. New articles will be shared automatically. A Catholic Life Twitter - Join our Twitter feed which has been sharing articles for the past few years. A Catholic Life Instagram - Follow us on Instagram to see some of the beautiful photos from awe-inspiring Catholic Churches around the world. A Catholic Life You-Tube - Original videos will be uploaded and hosted on our You-Tube Channel.